"The cheapest way to radically cut greenhouse gas emissions from generating electricity by 2030 would be a high-voltage direct current (HVDC) grid connecting America's prime renewable resources to 256 electricity markets." This recent report in UnderstandSolar.com further validates the GENI Initiative. 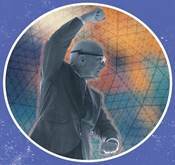 For over 25 years we have driven the strategy to link renewable energy resources around the world – the highest priority objective of the World Game™ simulation from Bucky Fuller. While this report focused on the United States, the strategy is valid in every nation. Abundant renewable potential exists on all continents, often in remote locations – and high-voltage transmission enables access and enhances reliability. 197 nations signed the Paris Climate Agreement pledging to reach the 80% renewable goal by 2050. We have the technology to make this transition. We are seeing the predicted climatic consequences of inaction. The 80% clean energy goal by 2050 requires every nation to radically shift policies, plans and investments. We know what to do. P.S. Support our GENI TrimTab Campaign. This global effort requires funding to succeed.